By tube detonation destroyed German 105mm howitzer. 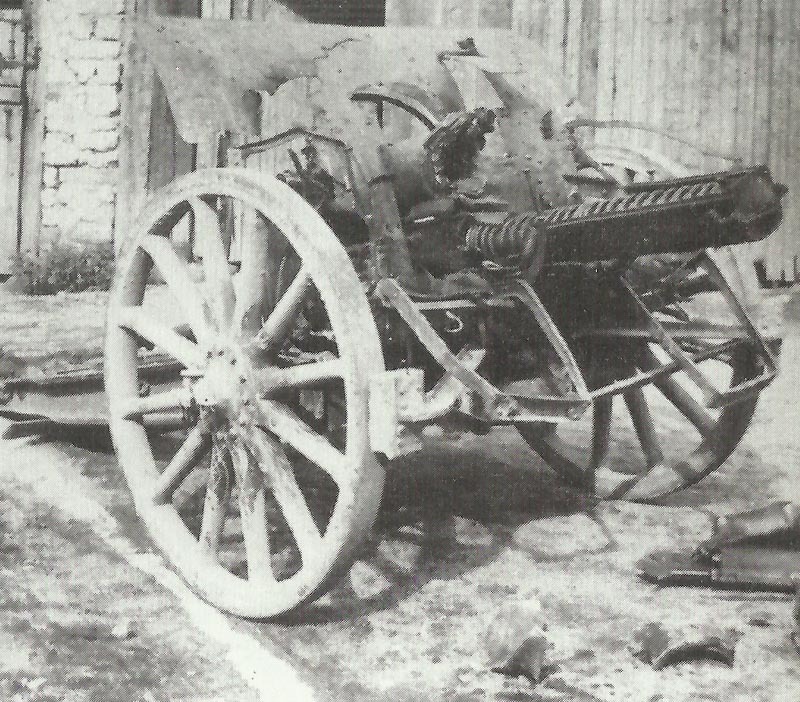 Daily on average 10 field guns and howitzers of the field artillery were lost. Battle of the Somme: Army Group Crown Prince Rupprecht created for duration. General Gallwitz in command of German Second Army records that since June 26 1,068 field guns of 1,208 plus 379 of 820 heavy guns have been captured, destroyed or become unserviceable in his two armies. Germany: Prince Leopold of Bavaria replaces Hindenburg as C-in­-C East (Hoffmann his CoS is the real chief). Rumania: Austrian monitors shell Danube towns. Rumania: First Army Zeppelin raid on Bucharest (night August 28/29, 4 more in September). GERMANY DECLARES WAR ON RUMANIA (TURKEY on August 30). ITALY DECLARES WAR ON GERMANY. Mesopotamia: Maude succeeds Lake as C-in-C thanks to CIGS, Major-General Cobbe (Victoria Cross) takes over Tigris Corps which now has 64 river steamers supplying 460t per day (but 560t needed), 3 railways being built. 11,000 troops invalided out in August.